CapEd Credit Union’s EnergyWise Loan helps members afford 10 qualifying weatherization improvements. Rather than using borrower credit scores for underwriting, the credit union employs a custom affordability matrix that ensures members get the right loan size and term for their budget. With a landscape that encapsulates deserts, mountains, farmland, and waterfalls — and more than a dozen national parks, monuments, and sites — Idaho truly is a “Gem State.” But the residents that make the state their home must be prepared for weather than ranges as widely as the landscape — from snow and ice in the winter to triple-digit heat in the summer. That’s why CapEd Credit Union ($664.8M, Meridian, ID) offers a loan product that helps borrowers fortify their homestead against the unrelenting weather of the West. Morriss spearheaded the rollout of the loan three years ago, when he’d been at CapEd for more than a year and noticed an influx of loan requests for home improvements. The credit union’s EnergyWise Loan offers financing for 10 qualifying weatherization improvements: weather stripping, windows, roofing, insulation, doors, pellet or wood stove, furnace, water heater, heat pump, and air conditioning. When Morriss launched the weatherization loan at his previous shop, the effects of the recession were still apparent and borrowers’ credit scores were a bit lower than in other areas of the country, Morriss says. To accommodate, the credit union focused on two underwriting criteria. First, borrowers had to be homeowners current on their mortgage payments. Second, borrowers had to demonstrate the ability to repay the loan. Although the economy has since rebounded, CapEd carried that best practice into its own weatherization loan. The credit union determines how much loan a borrower qualifies for by looking at monthly household income; it determines interest rate by looking at the borrower’s credit score. In nearly three years, CapEd has closed more than 400 weatherization loans with an average loan amount of $6,800 and yield of 6%. And it has sustained only a single loss. For example, borrowers with a monthly household income of $4,000 to $5,100 qualify for a $16,000 loan paid back over five years. Depending on credit, the interest rate falls between 6.19% and 10.99%; a borrower with a credit score between 650 and 700 would get a rate of 8.19%. CapEd members can use its EnergyWise Loan to finance variety of weatherization improvements or qualifying appliances. CapEd’s EnergyWise Loan is designed to replace higher-interest rate products that members typically turn to for home improvements, such as a credit card or HELOC. As such, roofing and heating and cooling companies have made attractive partners. At the point of sale, CapEd’s partners suggest borrowers look at the credit union as a financier. It’s not unlike an indirect auto loan, but the relationship is less formalized. Even so, such relationships have proven beneficial to the credit union as its receives a steady stream of applications from these referrals. “They’re championing the product more than anybody,” Morriss says. But these are not auto dealers, and this form of lending does not have the foundation it does in autos. According to Morriss, roofing and heating and cooling companies require as much, if not more contact. It’s a fact that caused a slight realignment within the credit union. As indirect loans have strategically become less of a focus at CapEd, the credit union has redeployed internal talent and resources into other areas of the organization. 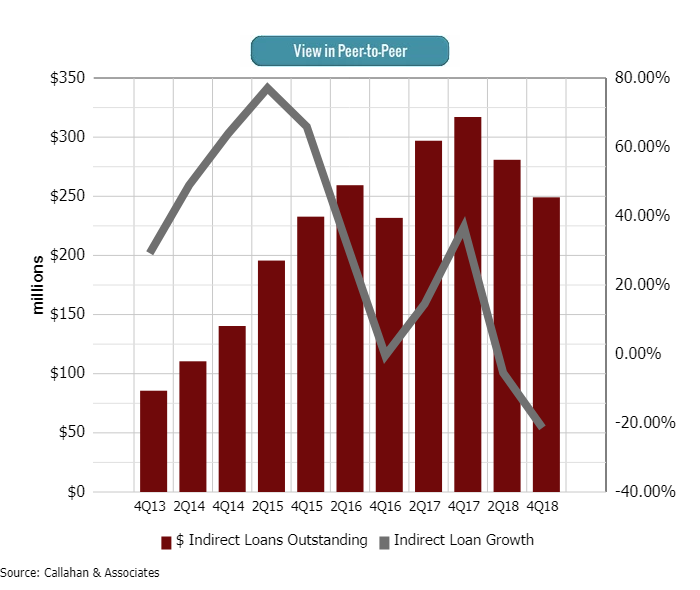 Total indirect loans at the Idaho cooperative — the vast majority of which are auto loans — peaked one year ago as CapEd looked for more direct lending opportunities to minimize dealer incentive payments and portfolio losses. Weatherization loans are one such opportunity, so the credit union reassigned, and retrained, its indirect dealer representative to work with local roofing and heating and cooling companies. CapEd’s weatherization representative schedules time with technicians and sales people to educate them on the program’s requirements and distribute marketing materials. A simple loan process is another selling point. When CapEd started working with these companies, it relied on inbound calls that didn’t always come. So, the credit union flipped the script. Now, companies pass on the names and contact information of interested consumers and CapEd reaches out. Moving forward, Morriss would like to add more partners — from heating and cooling companies to insulation companies; window fitters to roofers — to will help the credit union hit its portfolio goal. In the next two years, CapEd wants to double its production and make 800 to 1,000 EnergyWise loans. “We’re barely scratching the surface,” the lending executive says. Beyond building business partners, two marketing blitzes nearly 18 months ago — one in the early spring and one in the early fall, when most people think about their heating and cooling needs — attracted an influx of interested members. According to Morriss, that early fall campaign netted nearly twice as many calls than similar messaging in early spring. Still, most interested borrowers don’t hear about the product from the credit union. If they’re not referred by local companies, they find the product’s website. Over the years, Morriss has identified several best practices that extend beyond the timing of market messages. On the company side, the CLO says clearly communicated privacy requirements discussed upfront with new and prospective weatherization dealer partners will greatly limit frustration down the line. For example, the credit union cannot divulge the approval or denial status — or really any component of the lending process — to a company without the written consent of the borrower. Explaining this protocol early in the loan process heads off complaints and concerns. Also, pay the company as soon as the loan is funded. CapEd does not pay referral fees, but Morriss believes its prompt funding keeps partners happy. On the credit union side, analyze and manage the affordability matrix to make effective and efficient loan decisions. Additionally, make sure the borrower can repay. Morriss firmly believes this program — credit score-blind as it is — does not work without the ability to repay principle.